CliCK on the Photo for more pics! @ecotav or @halyma, originally uploaded by Halyma. My booths at all trade shows represent my universe of creativity/activity/craziness! The Ottawa Dancers’ Bazaar is not different! With just about 200 people coming through the doors, our numbers have been declining in mass but increasing in sensitiveness – the folks who are coming in are all leaving with something so we know they are there to shop! With everyone classes down a bit over the past few years, it’s easy to see why we are not swamped with folks to entire afternoon. At the same time, it is so nice to see all of the familiar faces, and meet the folks who have emailed me over the years and now I finally see them in person. So, once again, I take the Monday after the Bazaar to reflect and clean up – repacking the volunteer box, putting away the tents and poles and everything fun we use to create a comfortable relaxed atmosphere for our shoppers and vendors…. 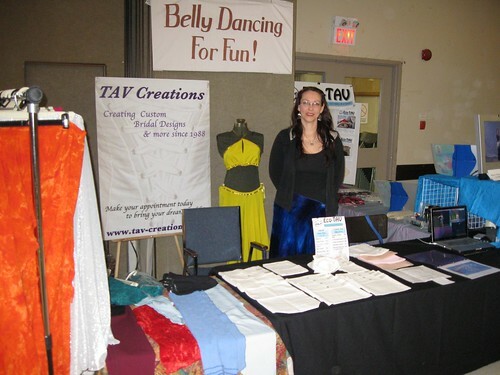 But in the meantime, if you are looking for some great belly dance or bollywood goodies and did not make it to the bazaar, but sure to check out this link for the bazaar vendors who have websites, and the Shopping Opportunities page connected to the Dancers’ News for other vendor info ! And if you know of anywhere amazing to get stuff throughout the year – please post the info in the comments ! Thanks to all who came, supported, shopped, sold and how lucky are we-we’re a part of a great community here in Ottawa!